Just Wills and Legal Services is Recruiting! When you work with Just Wills and Legal Services, you retain your independence, while still benefiting from being part of one of the UK’s biggest and fastest growing Legal Services Providers. And even as self-employed consultants you can take part in our unique profit-share and share option scheme which means that you will share in the success and reputation we are building. You are invested in our success – and we are invested in yours! 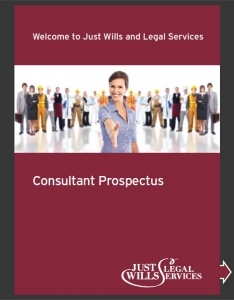 But why join Just Wills and Legal Services? David McMaster founded JWALS in 2013 with a highly experienced group of Consultants and Partners that he had worked with for many years. They wanted to bring together people who had a passion for what they do, and create the best home service Estate Planning business in the country. We have quickly built a business which now covers most of England and Wales and is growing rapidly. We have a solid reputation for affordable, professional expertise and reliability. David was part of a group that founded The Professional Association of Legal Services (PALS) back in 2002, which guarantees continuity of service to all our clients – and yours, if you are working with us. We are regulated by The Society of Will Writers. and that all members are bound to a strict code of conduct. We expect all consultants joining us to keep to the high standards set by our regulator, so that you can be covered by the reassurance these standards give to clients. We have an ongoing company expansion strategy, which includes the recent acquisition of Questor UK Ltd, Cheshire Wills Ltd and Affinity Wills Group. If you are interested in working with us you can view the full job description here .